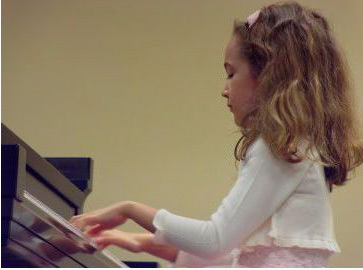 Taking piano lessons should NOT be about endlessly repeating scales for hours and hours. It’s about taking the pressure off and allowing you to find your OWN musical genius! From beginner through advanced, we will do things musically that YOU are excited about. We start by pinpointing weaknesses that block you from moving to the next level. I’ll give you the technique to improve quickly and painlessly. ​Whether it’s rhythm, melody, or technique, together we will find the solution to bringing your musicality to its ultimate height! Creates a sense of community. Provides a means of making up a lesson without inconveniencing the student or teacher's schedule. ​In addition, as a courtesy to students and their families, music will be available in the studio for the convenience of the student, saving time and frustration for both of you. I also provide a variety of literature to the student who is eager to learn and likes the challenge of playing different styles. We also have various programs such as Show Time! and Awards! that support and encourage progress in each and every one of our students. Click on the links above to learn more about these programs.